The fights resonate still: The Fight of the Century, Down Goes Frazier!, The Rumble in the Jungle, The Thrilla in Manila. And the fighters, too- MUHAMMAD ALI, JOE FRAZIER, GEORGE FOREMAN- three complicated and competitive men who happened to be vying for sport's biggest prize when boxing was still a national reassurance and its champion a cultural resource. They fought five times for that title, from 1971 to 1975, ranging across the globe, and their struggles, triumphs, and defeats echo through the years as well.At the time, however accidental their convergence, it was an irreproducible pandemonium. Three of them? At once? Those fights made for a roiling and convulsive tournament, all the more striking against a backdrop of national dysfunction. Their competition- fighting each other in every possible combination, on nearly every possible continent, to nearly every possible outcome- mattered as much for the country's confidence as it did for deciding the titles at stake. In fact, their heroic efforts- global spectacles that offered brief glimpses of clarity and confidence- may have been the only thing that made sense back home during the social and political morass of the 1970s. This golden age of boxing reassured a shattered country that such fundamental, if sometimes elusive, qualities as courage and determination still mattered. And when it was all over, neither the contenders nor the rest of the word would ever be the same.In Bouts of Mania , longtime Sports Illustrated writer Richard Hoffer evokes all the hopes and hoopla, the hype and hysteria of boxing's last and best "golden age." 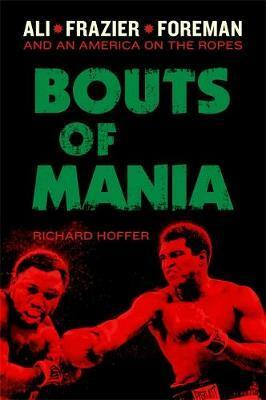 Advance praise for Bouts of Mania "I'm old enough to have lived through, and even covered part of, the raucous era defined by that immortal troika of Ali, Frazier, and Foreman. What could be better? Well, reliving it through the piercing prose of Hoffer, one of the few stylists able to capture this dark and dizzying decade of the '70s." --Jack McCallum, bestselling author of Dream Team Boston Globe, 7/10/14 "An entertaining reminder of the days when fighting had the power to thrill the country and cause riots at the same time...Bouts of Mania honors [the boxers'] struggles with lovely prose. It was often observed that while boxing was the most brutal of sports, it inspired much of the best sportswriting. From Norman Mailer to James Baldwin to Joyce Carol Oates, some greats have taken their shots at the sweet science. Richard Hoffer's new book continues that fine tradition." Kirkus, 7/1/14 "Fans of the sweet science should enjoy this shaggy yarn of a bygone contest and era." Richard Hoffer has been an award-winning writer for Sports Illustrated for more than twenty years and is the author of three previous books, including A Savage Business: The Comeback and Comedown of Mike Tyson. He lives in Santa Barbara, California.